COP15 and CMP5 Side Event "Low-Carbon Asia: Visions and Actions"
This session presents visions for sustainable low carbon development in Asia, and discusses how domestic actions (including Japanese “Isson-Ippin”) and international institutions (including enhanced market mechanisms) can contribute to low carbon development in major Asian economies. 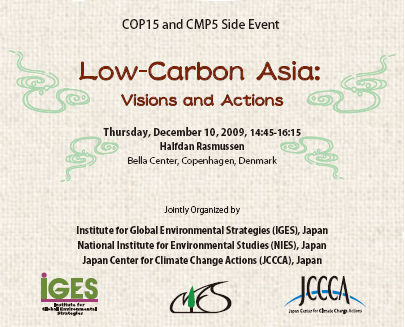 Sustainable low-carbon society visions and actions focusing on major Asian countries and cities show possible drastic GHG emissions reductions with feasible roadmaps, available market mechanisms, the Japanese local action “Isson-Ippin”, and effective Asian and global international institutions. What paths are possible in order to achieve a low carbon Asia where GHG emissions are low and the quality of life is high? What kind of actions is effective to realize a sustainable low carbon Asia? What kind of institutions can contribute to low carbon development in Asian economies? The Ministry of the Environment of Japan (MoEJ) and the Department for Environment, Food and Rural Affairs in the UK (Defra) are jointly promoting a scientific research project toward achieving a Low Carbon Society (LCS) by 2050. The National Institute for Environmental Studies (NIES), the UK Energy Research Centre (UKERC) and the Tyndall Centre for Climate Change Research are conducting research activities in line with this goal. We held the 1st LCS workshop in June 2006 (Tokyo), the 2nd LCS workshop in June 2007 (London), the 3rd LCS workshop in February 2008 (Tokyo) and it summarized research outputs for G8 Japan. 3rd LCS workshop: Go to the 3rd workshop page.